Cloudy skies. Slight chance of a rain shower. High around 60F. Winds E at 5 to 10 mph..
Cloudy skies with a few showers after midnight. Low 49F. Winds ESE at 5 to 10 mph. Chance of rain 30%. 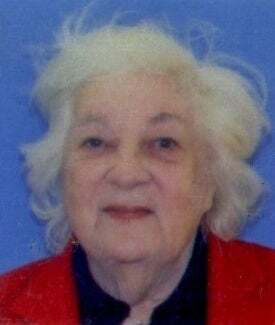 Mrs. Gloria Louise (Aertker) Fralish of Middlesex Township was called home from Harrisburg Hospital on September 23, 2014. She was 89 years old. She was born at 2004 Jackson Street, Alexandria, Louisiana, on Thursday, November 27, 1924, the daughter of the late Bernard Leonard, Sr. (“Ben”) and Guerry (Ward) Aertker, in a house still standing in Alexandria’s historic district which is today the headquarters of the Democratic Party of Rapides Parish, La. Her grandfather, John Joseph Aertker (1850-1901), had at one time owned the land on which most of the city was built. The Red River Plantation, measuring 500 acres, was destroyed in three successive annual floods, and within a year thereafter John Joseph died, leaving a family of eleven children who learned perforce to overcome the obstacles life placed in their way. Mrs. Fralish was a descendant on her maternal side of Abraham du Pont VIII of Rouen, France, great-grandfather of Samuel Pierre du Pont de Nemours, the Physiocrat who was minister to Louis XV and Louis XVI and friend of Jefferson, through Alexandre du Pont, who migrated to South Carolina in 1695 from France through New York City. Other ancestral families on the maternal side were the Pooles, Bridgemans, Dennises, and Mannings of early Virginia. Her Revolutionary War patriot ancestor of record was Thomas Crosby, a South Carolina militiaman. Another Revolutionary War ancestor was Thomas Ward of Charles County, Md., who took up a land grant for his service in Wilkes County, Georgia. Her great-great-grandfather Thomas Ward, Jr., operated the mill at West Point, Ga., which was the origin of the West Point–Pepperell Co. The Aertker ancestor came to America in 1870 from a large family that included many priests and nuns in Ostbevern, Germany. The day she was born was the same as that of the first Macy’s Thanksgiving Day Parade. This was an omen of her amazing character, which was a combination of hope, the pursuit of education and excellence, esthetics in one’s environment, and what is right and good even when all seems lost. Some of the characters in the parade have held similar attributes. Her case of rheumatic fever in the first days of life was the first obstacle. Her father had some trees ready to plant; planting each tree, he returned to the house to see whether his precious daughter was still alive. Half a century later when walking was painful for him, he learned she was coming from Pennsylvania to see him and crawled over 100 yards to his strawberry patch to pick the finest for her. She realized then, she said, if she had not known before, how much he loved her. He died suddenly on May 31, 1978. Her mother had passed away with equal suddenness on February 9, 1972. One of her earliest memories was of the night in 1929 when, aged 4, she notified emergency personnel that the family home in Alexandria was filling with gas. She saved the lives of her parents and siblings. She endured piano lessons that were so impossible she changed instruments; she was before long a state champion trombone player. In grade school she was among those who were forced to write with the right hand against nature. At high school graduation she was sent to Sullins College, Bristol, Va. (since merged with Kings College), then essentially a finishing school, and the tuition was paid by her maternal grandmother, a sternly Victorian but loving lady, Mrs. Samuel Guerry (Annie Olivia Sims) Ward. Seeing a spark of possibility in this girl, an aunt on the paternal side, Mrs. Florence Myers, a teacher whose husband John was on the faculty of the Louisiana State University (and had been a speechwriter for Huey Long), took her under her wing and sent her to study at that institution, class of 1946. She finished her credits in 1944 for a journalism degree and taught a year of high school at age 19. She went to New York to enter the Barbizon School but was soon recruited by RCA to receive cables, after an interview by General Sarnoff, and it was she who received the message Gen. George S. Patton sent confidentially from the European front to his family. The only statement she ever gave out about that experience was that the negative public impression of the general was false, from the evidence of the cables. While in New York she saw a bomber aircraft hanging from the side of the Empire State Building—it had struck the landmark by accident in fog. In the meantime, she was being courted by an Army officer. She was among the LSU girls invited by the mayor of Baton Rouge to dance with the gentlemen based at Camp Van Dorn, Miss., on November 30, 1943, on the roof of the Heidelberg Hotel. One of them, Capt. John C. Fralish of Daytona Beach, Fla., was there to celebrate his birthday. One look at Gloria was all he needed to realize he was meant to spend his life as her husband. He was one of the last officers of the Army’s horse-drawn artillery at the time. The military had to shift these men to standard artillery, which delayed their move to the European Theatre until the end of 1944, when he disembarked at Nice, and he remained in Europe until March 1946 after use of atomic bombs ended the war and prevented his being shipped to the fighting in the Pacific. Wedding plans were made by long distance. Gloria became a flight attendant for Colonial Airways, a Canadian line, and remembered flying over Hershey with its cocoa lettering in shrubbery. She was not as sure of her future as her husband-to-be was. In those long wartime months of 1944 she had “dragged” (dated students at) the Naval Academy and met a series of promising middies. Nearly all failed to survive the war, shattering her heart too often; she kept mementoes of every one. It took a long time to accept John’s proposal, but their song was Always (Irving Berlin, 1925). In his absence she sought solace on quiet visits to the Cloisters in New York, and as the product of a Catholic-Baptist marriage she had been left to find her own way in religion. One day she walked into an Episcopal church on Long Island and realized she was where she belonged. Her records as a parishioner are there to this day. Despite losing her supportive grandmother, Mrs. Ward, suddenly on April 25, 1946, she kept to schedule. The marriage was celebrated in a setting she designed—everything was white, adorned with materials that were nearly impossible to find in those times of shortage—at St. James’s Episcopal Church, Alexandria, on June 23, 1946. Ben was told by the local Catholic church that he could not attend; he refused to listen to that foolishness and gave his daughter away proudly. A week later John learned that he had been accepted as a regular officer in the Army, settling him in a career. He was posted to Ft. Sill, Okla.
A military wife, Mrs. Fralish had to reorganize her household in more than 100 different places over the succeeding twenty years. The service shifted people several times at each assignment before settling on proper quarters. First, the little family moved to Guatemala City in October 1947 for a year and a half while John was attached to the embassy. There her second son was born 2½ months premature. The next duty was at Ft. Lewis, Wash., where news was received of the outbreak of the Korean War. John, then a major, told Gloria it had been too little time since the big war for him to be sent to this smaller one. He was on the first troop boat out of Puget Sound. On November 30, 1950, his unit was enveloped by the Chinese, and he was badly wounded trying to save his battalion, the 503rd FA. It took him months to recover in military hospitals in Japan and Hawaii. Meanwhile, Gloria too her two little boys on an odyssey in an effort to find a home base, which she thought she found in Colorado Springs, but she realized that if she bought a house with the available money there would be nothing left for furnishings. The Army had provided those in the previous homes. She returned to Alexandria until John returned to duty in mid-1951—at Ft. Sill. There, focused on rearing her children, she battled a sort of scale condition which impeded vision but disappeared suddenly after a year, and the school system forced her younger son to enter school too soon—only for him to come down with polio, which her ministrations kept from being a crippling case. Her husband had mumps at the same time. She became a Red Cross Gray Lady. Her aunt, Mrs. Myers, who had been widowed in 1950, kept her spirits up by calling her from Baton Rouge to talk for an hour or more every Sunday, starting a tradition that continued for nearly 40 years. However, John’s career was on the rise; it was at Ft. Sill that he wrote the standard artillery manual which was still being used by the Army during the Vietnam War, and he was promoted to lieutenant colonel. He took the family with him to Europe in May 1955. They arrived at Bremerhaven on the day West Germany was given sovereignty; he was assigned to USAREUR at Heidelberg. Gloria learned some German, but it was of little use outside the city, because it was Heidelberg market patois, a medieval dialect. She decided to try to change the rules she felt had operated against her son by running for the presidency of the parent-teachers’ association in the military school system in Germany but lost by one vote—her own, cast for her opponent out of courtesy. In the second half of this three-year tour the Fralishes lived in Darmstadt while John commanded the 216th FA Battalion. A child was stillborn there in November 1957. The family went on a cruise of the Mediterranean in January 1958. The next tour of duty was at the Pentagon. Gloria returned with her family from Europe on the U.S.S. Constitution that May, settled in Arlington, and nearly died in childbirth on October 29, 1958. The rest of the family had to take on some of the duties of caring for her daughter, last of their number. The new mother was back on wobbly feet by the end of the year. In 1962 her husband entered the ’63 class of the Army War College at Carlisle Barracks, Pa. At the end of that year of study they bought a farmstead in Middlesex Township and moved in July 16, 1963, intending it to be the permanent home. That it was; he retired in the summer of 1966. The house, dating from 1823, was badly damaged three times within a period of sixteen years by fires, caused by three different electrical problems, which ruined all her possessions. By the time of the third fire, in September 1984, John exhibited signs of Alzheimer’s disease. He was diagnosed in September 1987, and she cared for him at home until he died there on the morning of October 12, 1995, at the precise moment that an ambulance was on its way to the house to take him to be cared for at Lebanon Veterans Hospital. She kept busy through these tough years. She was one of the first members of Lowther Manor Questers, became a Dame Commander of both the Hospitaller Order of Knights of St. John and the Sovereign Military Order of Knights Templar, served as president of the Cumberland County Society of Farm Women (1976-77), and joined the Depot Club at the Army’s New Cumberland base. She taught quilting at Carlisle Barracks for one season around 1980. Interested in local history as a life member of Cumberland County Chapter DAR, she published a list of Cumberland County signers of the Oath of Allegiance to the United States in the Revolutionary War, and wrote short papers for the Questers group on the history of Newport, Pa., and the old black settlement in Mount Holly Springs. When the Institute of American Deltiology was formed in Myerstown in 1993 she began volunteer service helping to organize its collection and became a board member. Her beloved Aunt Florence passed away July 14, 1997. A more terrible blow fell on February 6, 2006, when word came that her eldest grandson, Navy corpsman John T. Fralish II of New Kingston, had been killed in Afghanistan, first combat fatality in that war from the Harrisburg area. She was too ill to attend the dedication of a 1,400-bed barrack building at Ft. Sam Houston, Tex., in his memory as Fralish Hall on April 19, 2011. She suffered a severe stroke on a visit to her informal cousin, Donald R. Brown, in Myerstown on July 7, 2011, and in late August she was moved to Thornwald Home, where she received care for which the family wish to express sincere gratitude. Mrs. Fralish was made Baroness of Axum for her assistance to the Imperial House of Ethiopia, with an effective date of December 1, 2010, and to this honor was added that of Countess of Axum for providing further help of the same kind. With her demise both titles descend to her elder son. Surviving are three children, John C. Fralish, Jr., Middlesex Township, James L. Fralish, New Kingston, and Anne F. Babcock, Hopkinton, Mass. ; a brother, Dr. Samuel Richard Aertker, Alexandria, La. ; eight grandchildren, several great-grandchildren, and numerous nieces, nephews, and cousins. An elder sister, Mrs. Frank (Joyce M.) Koch, was last known to be living in California. Besides her husband, her parents, her grandmother, aunts, and uncles, her grandson, her eldest great-grandchild Heather Johnson, and Walter Patrick Joseph (“Joey”) Fralish, her stillborn son, she was predeceased by a brother, Bernard Leonard (“Jack”) Aertker, Jr., and her daughter-in-law, Mrs. James (Jean Rynard) Fralish. Funeral services will be held at 11 a.m. on Friday, October 3, 2014 at St. John’s Episcopal Church, 1 N. Hanover St., Carlisle, with Rev. Canon Mark A. Scheneman officiating. Friends will be received for a viewing at Ewing Brothers Funeral Home, 630 S. Hanover St., Carlisle on Friday from 9:30 to 10:30 a.m. Interment at Arlington National Cemetery will be private. Memorial contributions be made to a local fire company of the donor’s area.